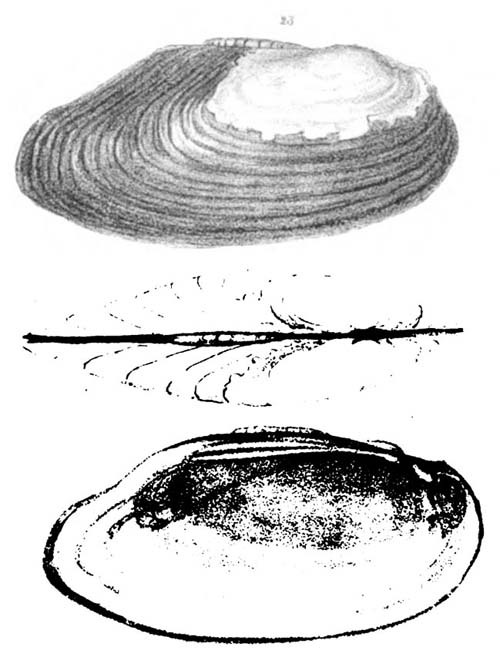 = Elliptio jayensis. — Perkins et al. (2017). 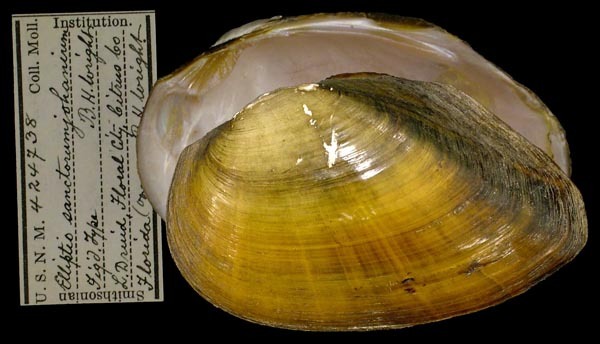 = Elliptio jayensis (Lea, 1838). — Williams et al. (2017). 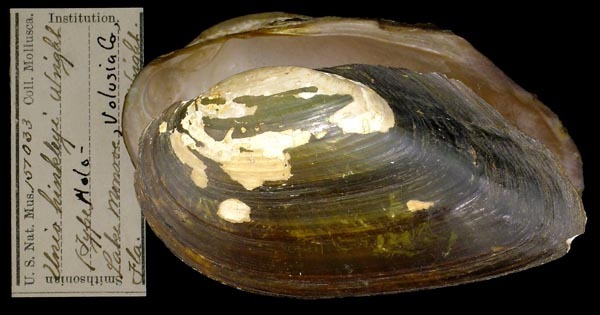 = Elliptio jayensis (Lea, 1838). — Williams et al. (2014). = Elliptio jayensis (I. Lea, 1838). — ITIS (2012). = Elliptio jayensis. — Haag (2012). + Elliptio buckleyi (I. Lea, 1843). — ITIS (2012).
? Popenaias buckleyi Lea. — ITIS (2012). 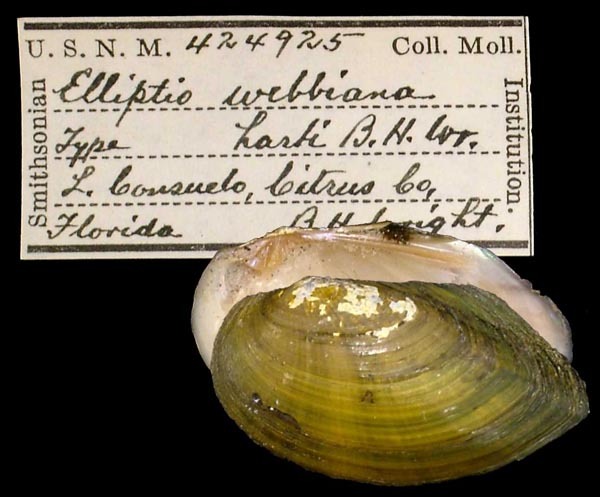 + Elliptio buckleyi (Lea, 1843). — IUCN (2011). 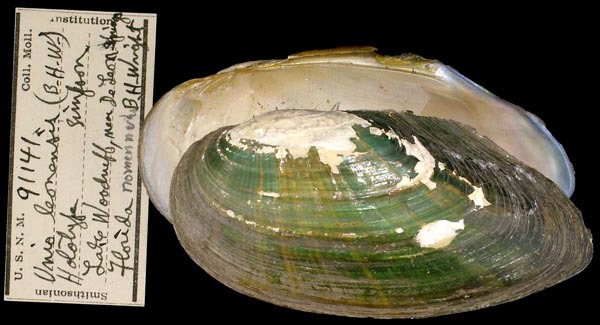 = Elliptio jayensis (Lea, 1838). — Williams et al. (2011). = Elliptio jayensis (I. Lea, 1838). — IUCN (2011). Lea, 1836, Synopsis Fam. Naiades: 37 [nomen nudum]. Lea, 1838, Trans. Amer. Phil. Soc. : 28, pl. 9, fig. 23. Lea, 1843, [privately published sheet]: . Lea, 1845, Trans. Amer. Phil. Soc. : 276 , pl. 39, fig. 2. 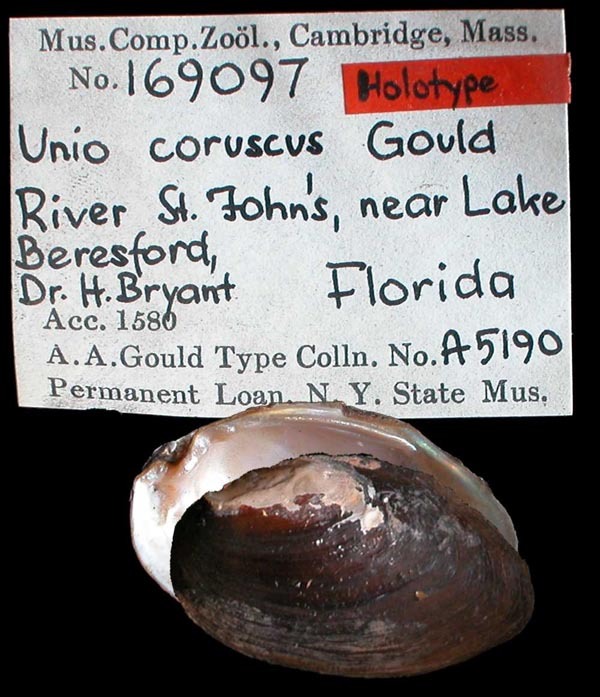 Type(s): FIGURED SYNTYPE USNM_85236, Lake George, Florida. Lea, 1845, Trans. Amer. Phil. Soc. : 277 , pl. 40, fig. 5. Type(s): FIGURED SYNTYPE USNM_85606, L. George, Florida. Margaron (Unio) bucklyi Lea, 1852. Adams & Adams, 1857, Gen. Rec. Moll. : 493 [as ‘Unio (Hyridella) bucklyi’]. Gould, 1856, Proc. Boston Soc. Nat. Hist. : 15. 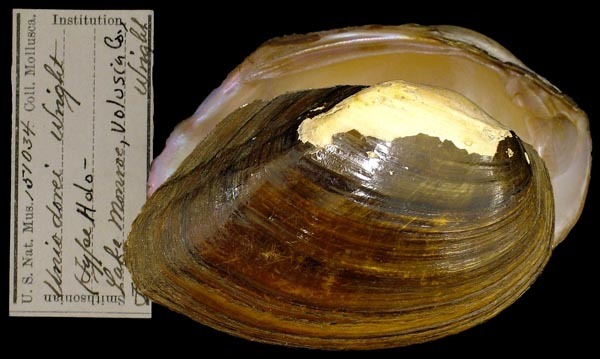 Type(s): HOLOTYPE MCZ_169097, St. John’s River, near Lake Beresford, Florida. Conrad, 1866, Amer. J. Conch. : 279, pl. 15, fig. 14. Margaron (Unio) jayanus Lea, 1870. ‘Lea’ Lea, 1870, Synopsis Fam. Naiades: 60. Unio cunninghami B.H. Wright, 1883. B.H. Wright, 1883, Proc. Acad. Nat. Sci. : 58, pl. 1, figs. 1-4. 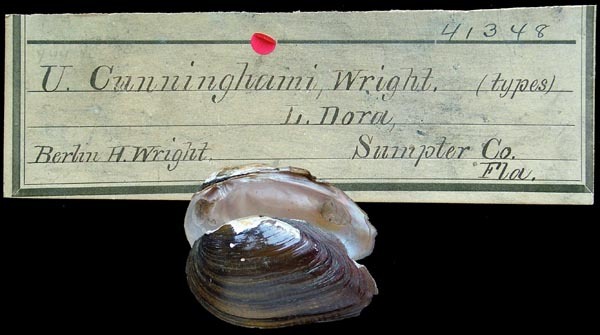 Type(s): LECTOTYPE ANSP_41348, L. Dora, Sumpter Co., Fla.
Unio marshii B.H. Wright, 1888. B.H. Wright, 1888, Proc. Acad. Nat. Sci. : 118, pl. 5, fig. 2. 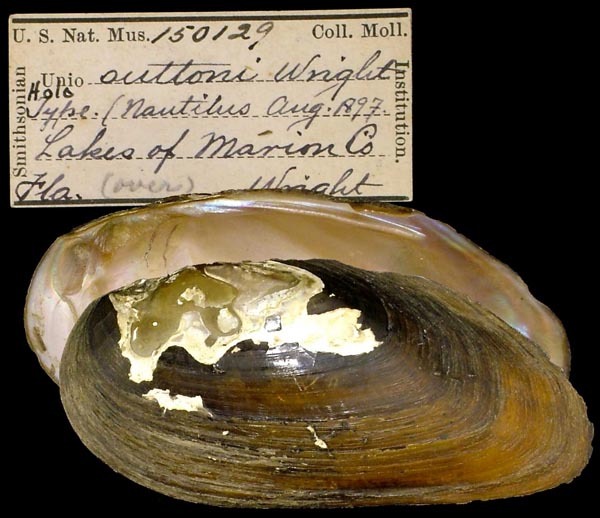 Type(s): HOLOTYPE USNM_151028, Lake Woodruff, Fla.
Unio nolani B.H. Wright, 1888. B.H. Wright, 1888, Proc. Acad. Nat. Sci. : 116, pl. 4, fig. 1. 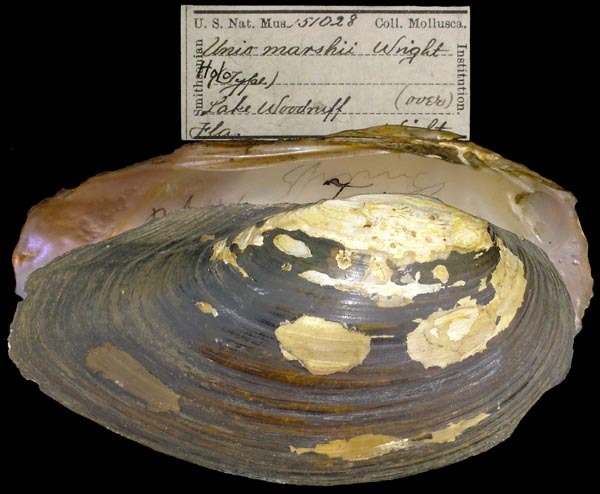 Type(s): HOLOTYPE USNM_151030, St. Johns Riv., Fla.
Unio orcuttii S.H. Wright, 1888. S.H. Wright, 1888, West Amer. Scientist: 60, fig. 3. 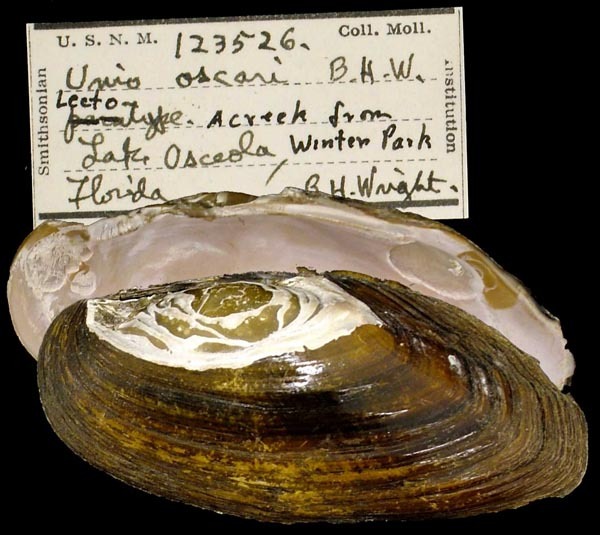 Type(s): HOLOTYPE USNM_308971, Horse Cr., near Manatee R., Manatee Co., Fla.
Unio simpsoni B.H. Wright, 1888. B.H. Wright, 1888, Proc. Acad. Nat. Sci. : 117, pl. 5, fig. 1. B.H. Wright, 1888, Check List: unnumbered p. 5. 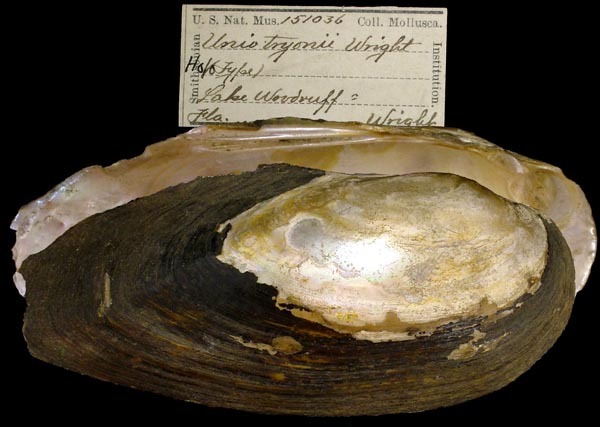 Type(s): HOLOTYPE USNM_151038, Lake Woodruff, Fla.
Unio tryoni B.H. Wright, 1888. B.H. Wright, 1888, Proc. Acad. Nat. Sci. : 120, pl. 6, fig. 2. 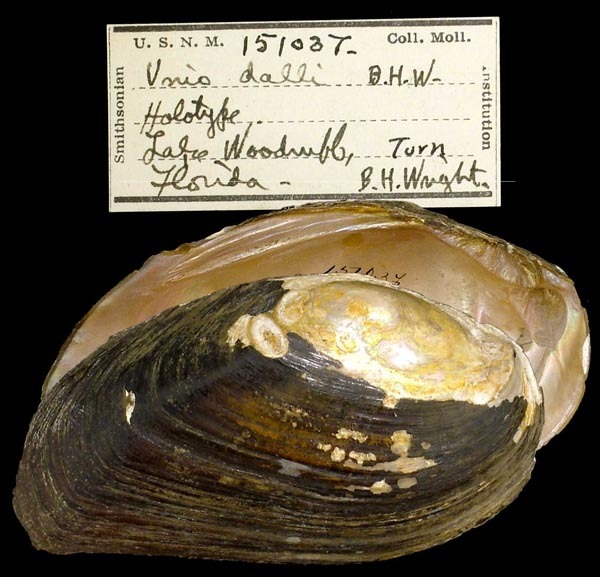 Type(s): HOLOTYPE USNM_151036, Lake Woodruff, Fla.
Unio dallii B.H. Wright, 1888. B.H. Wright, 1888, Proc. Acad. Nat. Sci. : 119, pl. 6, fig. 1. 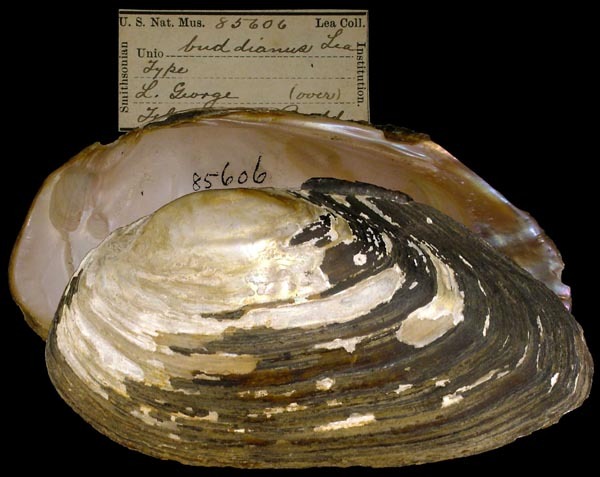 Type(s): HOLOTYPE USNM_151037, Lake Woodruff, Fla.
Unio dorei B.H. Wright, 1888. B.H. Wright, 1888, Proc. Acad. Nat. Sci. : 115, pl. 3, fig. 1. 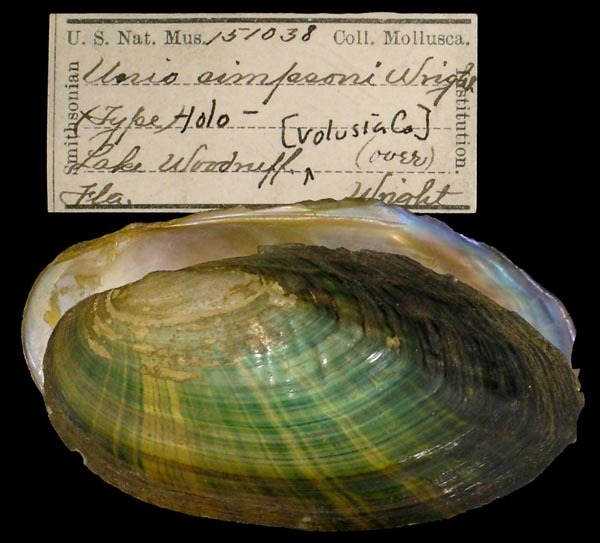 Type(s): HOLOTYPE USNM_151034, Lake Monroe, Volusia Co., Fla.
Unio hinkleyi B.H. Wright, 1888. B.H. Wright, 1888, Proc. Acad. Nat. Sci. : 117, pl. 4, fig. 3. 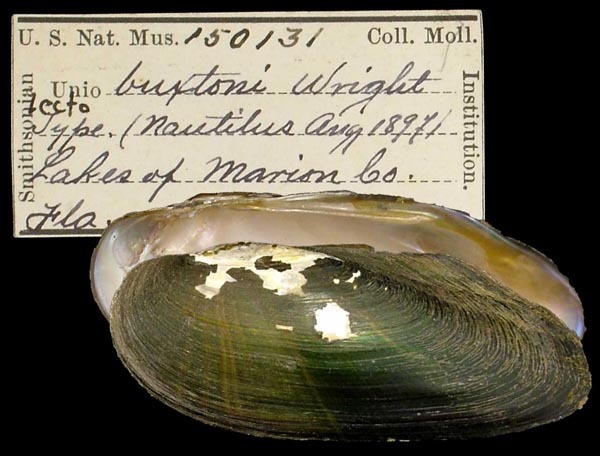 Type(s): HOLOTYPE USNM_151033, Lake Monroe, Volusia Co., Fla.
Simpson, 1892, Proc. U.S. Nat. Mus. : 423, pl. 66, figs. 1-2. ‘Wright’ Simpson, 1892, Proc. U.S. Nat. Mus. : 419, pl. 62, figs. 3-4. 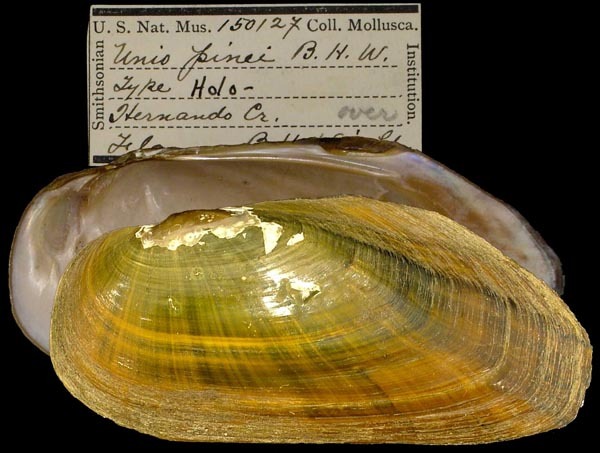 Type(s): HOLOTYPE USNM_91141, Lake Woodruff, near DeLeon, Fla.
Unio oscari B.H. Wright, 1892. B.H. Wright, 1892, Nautilus: 124. Type(s): LECTOTYPE USNM_123526 (selected by R.I. Johnson, 1967), Lake Osceola, a creek from Winter Park, Florida. Simpson, 1892, Proc. U.S. Nat. Mus. : 432, pl. 83, figs. 3-4. Simpson, 1900, Proc. U.S. Nat. Mus. : 743. 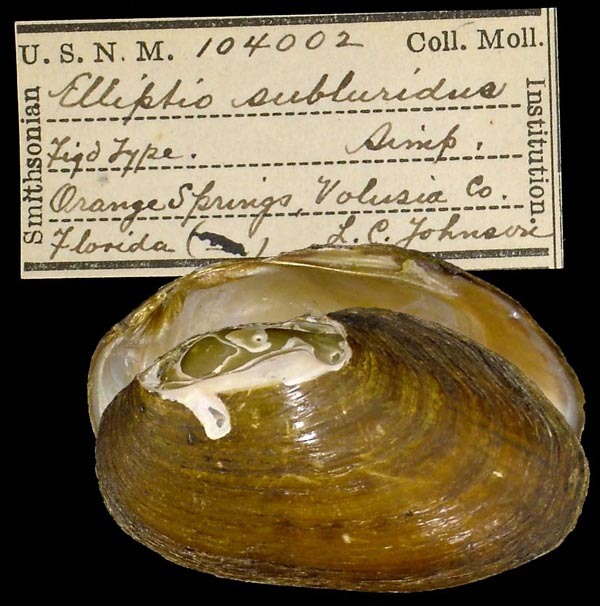 Type(s): HOLOTYPE USNM_104002, Orange Springs, Volusia Co., Florida. Unio buxtoni B.H. Wright, 1897. B.H. Wright, 1897, Nautilus: 55. 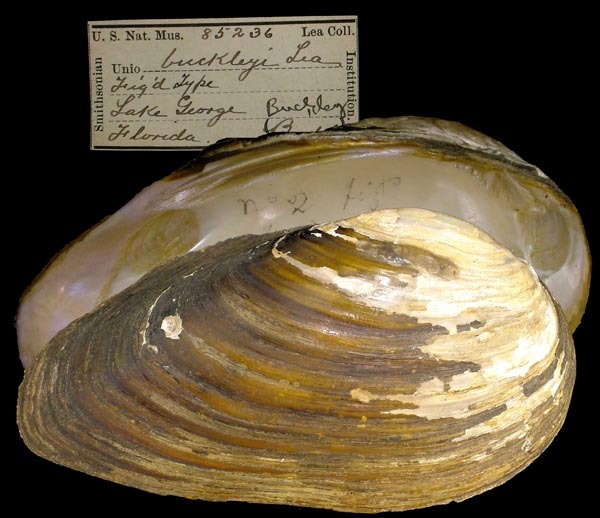 Type(s): LECTOTYPE USNM_150131, Lakes of Marion Co., Fla.
Unio diazensis S.H. Wright, 1897. S.H. Wright, 1897, Nautilus: 5. 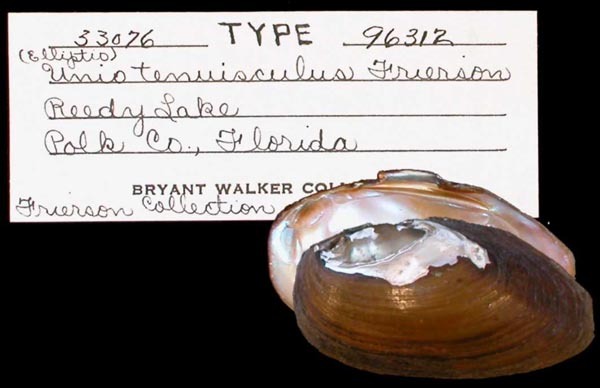 Type(s): LECTOTYPE USNM_149652, Lake Diaz, Volusia Co., Florida. Unio pinei B.H. Wright, 1897. B.H. Wright, 1897, Nautilus: 40. 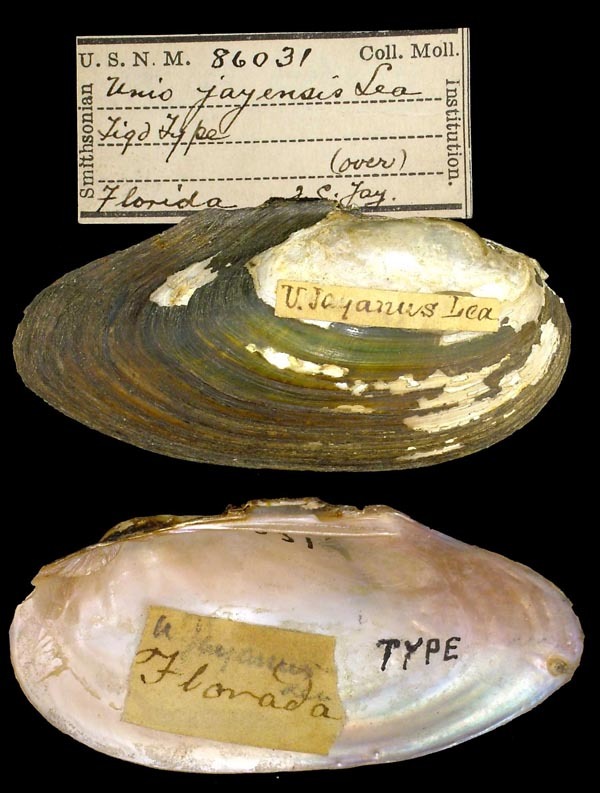 Type(s): HOLOTYPE USNM_150127, Hernando Cr., Fla. [not the published type locality]. Unio suttoni B.H. Wright, 1897. B.H. Wright, 1897, Nautilus: 56. 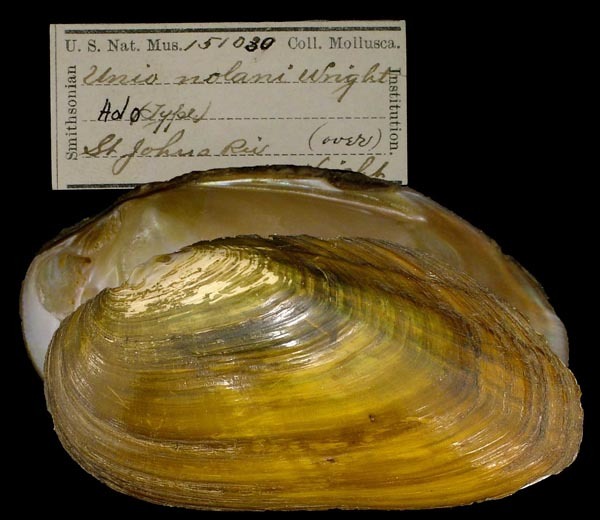 Type(s): HOLOTYPE USNM_150129, Lakes of Marion Co., Fla.
Dall, 1898, Trans. Wagner Free Inst. : 688, pl. 25, figs. 5, 12 b.
Frierson, 1911, Nautilus: 29, pl. 1, figs. 4-6. Type(s): LECTOTYPE UMMZ_96312 (selected by R.I. Johnson, 1972), Reedy Lake, Polk Co., Florida. Unio buckey de Gregorio, 1914. ‘Lea’ de Gregorio, 1914, Il Nat. Siciliano: 54. Unio (Elliptio) sanctorumjohanium B.H. Wright, 1933. B.H. Wright, 1933, Nautilus: 17, pl. 1. 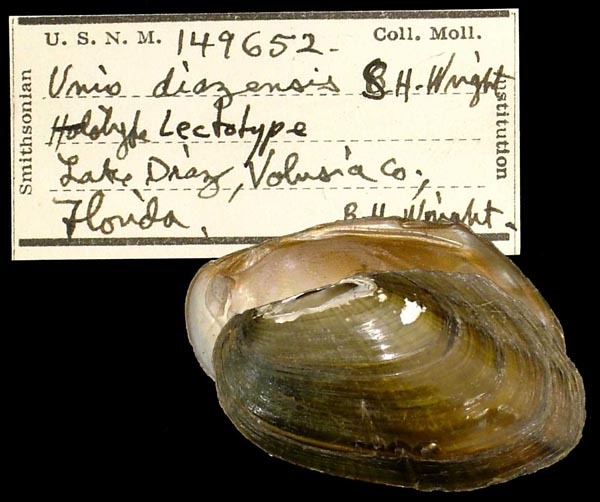 Type(s): HOLOTYPE USNM_424738, L. Druid, Floral City, Citrus Co., Florida. Elliptio maywebbae B.H. Wright, 1934. B.H. Wright, 1934, Nautilus: 28. B.H. Wright, 1934, Nautilus: pl. 13, fig. 6. 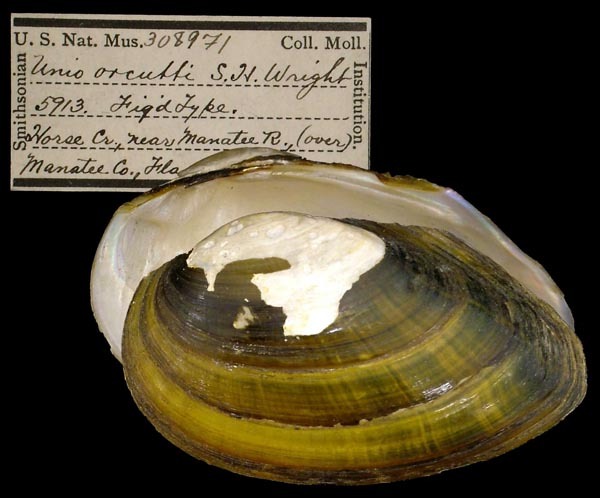 Type(s): HOLOTYPE USNM_425354, Seminole Springs, Florida. Unio (Elliptio) webbianus B.H. Wright, 1934. B.H. Wright, 1934, Nautilus: 94, pl. 10, figs. 1-2. 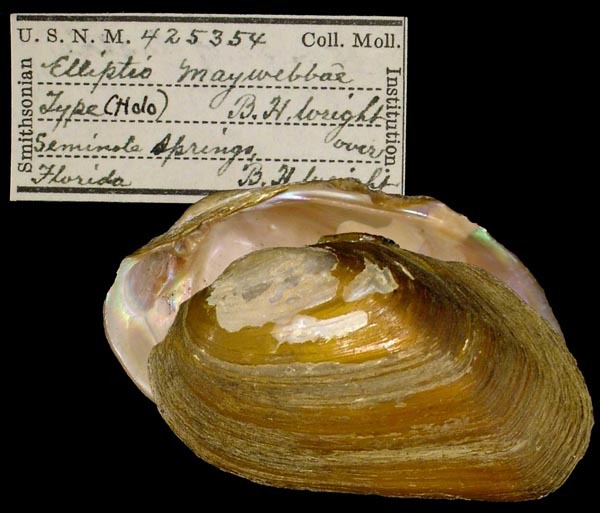 Type(s): HOLOTYPE USNM_424923, L. Consuelo, Citrus Co., Florida. 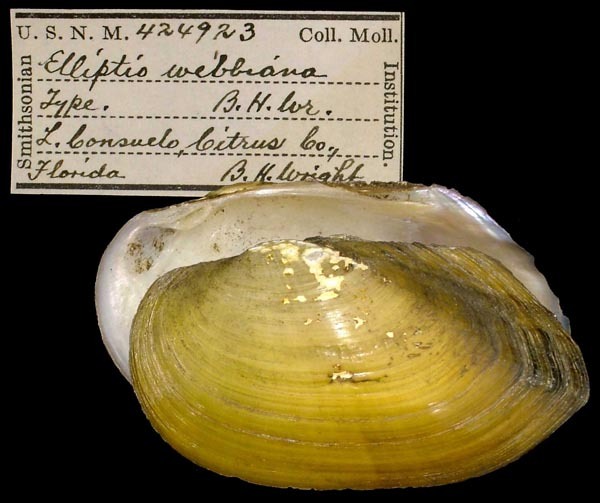 Unio (Elliptio) webbianus hartii B.H. Wright, 1934. B.H. Wright, 1934, Nautilus: 95, pl. 10, figs. 3-4. 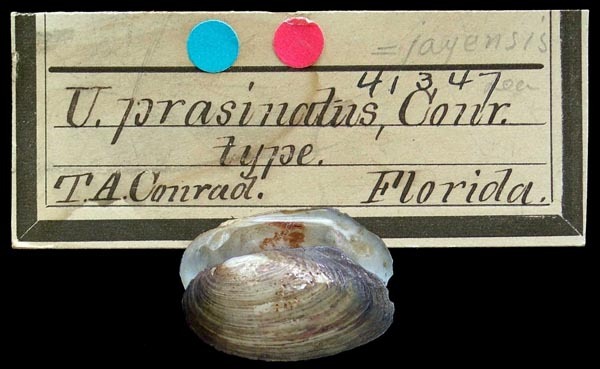 Type(s): HOLOTYPE USNM_424925, L. Consuelo, Citrus Co., Florida.